We encourage you to review the SAP Activate Show & Tell session here to learn about the key updates and listen to the more detailed SAP internal Delta Training session for SAP Activate that you can access on S/4HANA Product Management & Co-Innovation JAM site . Perform quick team onboarding and scoping: At the beginning of every deployment project, customer project teams are equipped with release-specific task lists, tasks sequences and assigned roles based on the SAP Activate methodology. Use a fit-to-standard implementation approach: SAP Activate provides all the tools required for fit-to-standard workshops using the implementation portal. 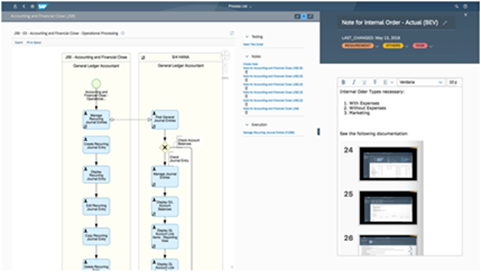 Customer project teams get a clear view of the steps required for successful deployment in the cloud at the outset of the project based on content from the SAP Best Practices package for SAP S/4HANA Cloud. 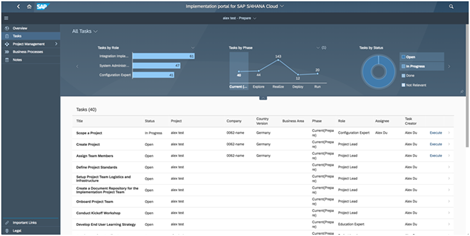 In the new implementation portal for SAP S/4HANA Cloud, we show you how the project makes use of SAP Activate. The recording is available for replay and the presented slides can be accessed here. SAP Best Practices Explorer is the one-stop shop for ready-to-run digitized business processes. View the What’s new by checking out the recently released packages and updates to our portfolio of SAP Best Practices solutions. In addition, you can now find S/4HANA Cloud related content in the SAP S/4HANA Cloud Implementation Portal. Revised the Prepare For Quarterly Upgrade task to include new guidance on BCP transports. In addition, a chart was added to easily view the Service Center cutoff dates associated with specific services. Cutoff dates in individual tasks were synchronized with the dates in the chart. Added links to the relevant SAP S/4HANA Cloud forums to both the Fit-to-Standard Analysis and the Solution Configuration tasks to facilitate the use of the improved SAP S/4HANA Cloud Customer Community. Updates to text to support the implementation portal functions. As of 1902, the content in the SAP Activate roadmap will also be used in the CALM tool. Added a feedback function to the Roadmap Viewer tool to allow for direct online feedback from the customer on the tool and the content. See the S/4HANA Cloud Release blog for a complete list of changes. Please find below a few highpoints related to the Deployment Experience. SAP provides pre-configured Chart of Accounts as SAP Best Practices, which you can either use as standard or adapt it to your business needs. In the self-service configuration “Define G/L Account Mapping” the new G/L account IDs are defined. Afterwards, in the app “Convert Mapped G/L Accounts” the changes will be executed. This includes master data, configuration data, and transactional data. The HouseBank ID and the Hausbank Account ID will be maintained in the realize phase now and no longer in the preset phase using the SSCUIs in the Manage Your Solution app. The first 90 SSCUIs will be enabled with a feature to delete unwanted records created by the customer with 1902. The SSCUIs that have deletion enabled can be identified in the Reference Excel in SAP Activate Roadmap Viewer. If deletion is possible in an SSCCUI, a delete button appears at the top of the SSCUI. Depending on the SSCUI, some deletions will not be allowed in order to prevent damage in the Production System. Save filter settings in user specific views and set a default view. An asterisk (*) wildcard can be used in the search. New warning message to inform users when SSCUIs are temporarily on display only. This happens during scoping or activation of scope extensions. The number of SSCUIs is continuously growing. In 1902, approximately 164 new SSCUIs are available providing a total of 1189 SSCUIs. Information about changed standard test automats in filter for test processes in “manage your test processes” app. Information about the type of changes done in standard test automats for test automation tool for S/4HANA Cloud (see What’s new document in test automation tool JAM Group, request access here. Within test automation tool for S/4HANA Cloud, the maintenance of the test user via “manage user” functionality in “test your processes” app gest mandatory, maintenance of test user via SAP Cloud Platform gets depreciated. Manage your test processes: New filter functions, warning message, when turning process steps to custom. Test your processes: Improved up/download of data variants; Re-execute button for failed “Post Upgrade test” plans. Analyze your test processes: Improved filter and wildcard search; Failure reasons at failed process steps. In 1902, the number of pre-delivered test automats for Best Practice processes increased to 214; for post upgrade tests there are 228 test automats available. Thanks Holger. Can you provide the link to request access to the test automation tool jam group?